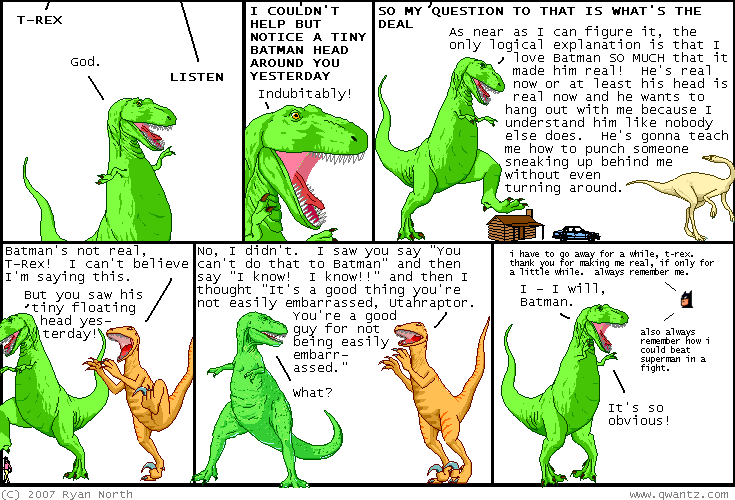 Dinosaur Comics - September 11th, 2007 - awesome fun times! September 11th, 2007: The I've Got My Own Problems shirt failed to meet the stratospheric expectations I had for it, so if you want one, be sure to order it before the end of today - Tuesday - because at that point they are DISAPPEARING. In other news, Devin made a plugin to the Mac chat program Adium that lets you turn every conversation into a Dinosaur Comic! If you find yourself thinking, "MAN, I like Dinosaur Comics, but Ryan doesn't update several times a day and his comics aren't about what I am typing into my chat programme - IS THERE NO HOPE?" well then guess what? There's hope now! One year ago today: utahraptor doesn't actually believe in book burning OR game melting. but, you know - controversy monday!